When Preston College opened its new £5m Visual and Performing Arts building, a new digital information point was put in place. 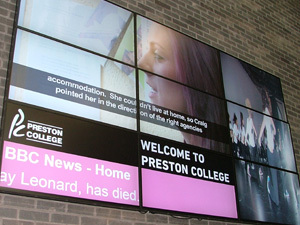 A large digital wall made of 9 thin framed LCD screens powered by digitalsignage.NET was installed in the reception area to greet visitors, present the college and show scenes from recent plays and drama nights. Winner of the LSIS Beacon Award for the Effective Use of Technology in Further Education Skills, Preston College wanted to set an example in the area of place- based communications too. As a result, they’ve decided to share local traffic information and other place- based information useful to both staff and students. To capture the attention of passers – by and inform the public about its rich history, the college made use of a 21” digital poster installed in front of the new building. 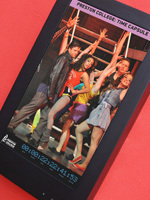 The Time Capsule, run by digitalsignage.NET, shows a selection of images from the college’s past, presenting its evolution in a dynamic, original manner. The college announces plans to use digitalsignage.NET for the LED screens and kiosks that they plan to install.